The athletics department reported a $1.54 million deficit last fiscal year, which ended in June. To the extent that it comes closer to breaking even this year, it will be thanks to the $1.5 million bailout from its virtual masters in Bristol, Conn.
That’s right: the blue line is for the current 8-4, bowl-guaranteed season. There are a number of explanations for why recent on-field success has failed to boost attendance: last year’s increase of season ticket prices set against a struggling local economy; the general decline of the Mountain West Conference; the over-saturation of college bowl games; the sclerosis from Mike Locksley’s dismal tenure; and the general disinterest New Mexicans have for college football. But the accommodations to national television, including late start times, have proven additionally unhelpful to building a stadium audience. What more, they have created a perverse incentive. Between the ESPN2 payments and the $900,000 UNM received for playing an away game at Rutgers, that’s nearly $2.5 million of the program’s revenue coming from sources unrelated to New Mexicans going to games. What is unfolding is the virtual reality of Lobo football: a program that is increasingly conditioned, even in good times, to make ends meet absent of its fans. At the going rate, the team might as well relocate next season to a soundstage at I-25 Studios. In a revealing Twitter exchange Sunday, between the Albuquerque Journal’s Geoff Grammer and UNM officials, the school seemed to make this concession, even as it tried to defend its financial trajectory. @RealDavidLynch Lots of reasons, I think. Big picture question is if even good FB can’t make money at UNM, why keep pouring more $ into it? 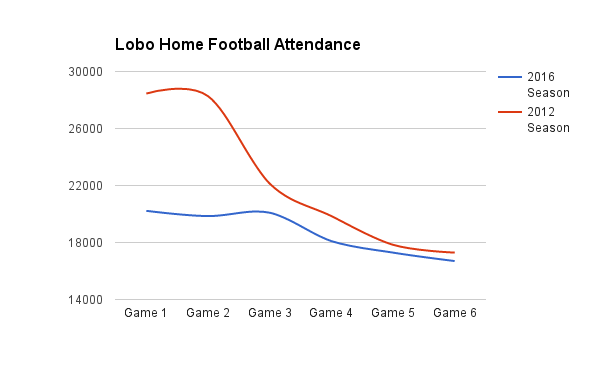 But Grammer isn’t over-dramatizing anything: UNM literally lost fans over the course of its best season in a decade. In August, the athletics department appeared before the UNM Board of Regents, tail betwixt legs, confessing that it had grossly overestimated season ticket projections for 2016. There was the intimation of honest dialogue about the sustainability of the department’s budget, given the financial drag of football. And yet, thanks to the Reserve Bank of Bristol, UNM will not be made to reconcile with this reality, at least not now. It just has to figure out how to guarantee three ESPN-televised games for next year. Correction: A previous version of this post had the Lobos’ score against Wyoming off by a point, and confused the 2012 season as being Locksley’s final, instead of Davie’s first (h/t Frank Mercogliano). The phrase, “Davie stole a bothered glance”, was changed to, “Davie cast a bothered glance”, because, well, it reads better. Voila! Why was The Pit's naming-rights sponsor soliciting UNM's AD for a campaign contribution?